Featuring more than 4500 works, it’s one of the biggest and most significant art collections in Australia outside a capital city, with an insured value of around $42 million. The jewel in the crown is the 1500-strong Howard Hinton collection, which spans the decades from the 1880s through to the 1940s, and includes masterpieces by Tom Roberts, Arthur Streeton, Margaret Preston, Norman Lindsay, Elioth Gruner, Lloyd Rees, Sydney Long, Nora Heysen, William Dobell and Margaret Olley. The Chandler Coventry collection of 1960s and 1970s Australian art, and the NERAM collection of more recently acquired works by major contemporary artists, make up the remainder of the holdings. A selection of 70 or so Hinton pieces is always on display at NERAM, usually in the Lalor Harris gallery, and an important part of Phillipa Charley-Briggs’ job as curator is devising fresh, thematic ways of cycling through the collection, choosing which ones to put up next. “As curator, I work with Caroline Downer, the director, and we plan the program of exhibitions together,” said Philippa, who came to NERAM almost four years ago with two decades of experience in art galleries and historic houses behind her. 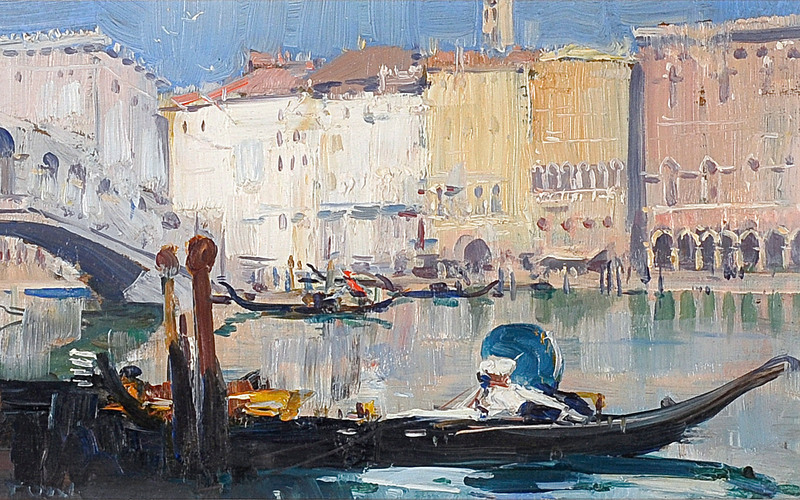 A recent Hinton exhibition theme was “The Grand Tour”, featuring the iconic and exotic locales that Howard Hinton and his artist friends would have visited while journeying around Europe and the United Kingdom. It was even arranged in the normal order of progression from country to country. She noted that these works, which Hinton collected while living in London and Europe, were typical of the pieces that Australians of that era tended to bring home. “They’re not by significant European artists, but they are the kinds of things that would have been collected by travellers at that time,” she said. Another 2012 display of works from the Hinton collection, titled “The Fashionable Hinton”, showcased portraits of men and women in a variety of clothing styles and included the well known Yellow Gloves painting by Esther Paterson. The task of finding pictures to suit a particular theme is made easier by a searchable database containing detailed descriptions of the works, said Philippa. A new Hinton exhibition is rolled out every three months, which means that over the course of a year about 20 per cent of the collection comes out of the storeroom and goes up on the walls. It’s a very physical task that involves hauling huge wheeled racks to display the pictures mounted on each side and climbing ladders to access those at the top, so changeover time sees a dedicated “hanging team” of experienced volunteers swinging into action. Philippa, who grew up in Armidale and moved back here with a young family, said she loves the breadth and variety that her 14-hour a week position encompasses. “I feel very lucky to have a part-time job like this where I can be working with such a fantastic collection. And it covers all aspects of planning and mounting exhibitions, which makes it extremely interesting,” she said. At the end of June, NERAM announced a $400,000 fundraising drive to augment the Hinton Collection with a masterpiece by the much-loved Australian artist, Margaret Olley. 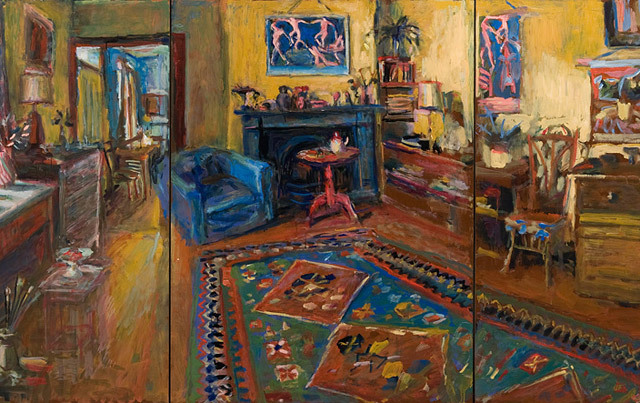 The Yellow Room Triptych, which is on loan to Armidale until October, will eventually join Mosman’s Bay by Tom Roberts as the only Hinton Collection paintings on permanent display.